Great white sharks – the top predators throughout the world's oceans – grow much slower and live significantly longer than previously thought, according to a new study led by the Woods Hole Oceanographic Institution (WHOI). In the first successful radiocarbon age validation study of adult white sharks, researchers analyzed vertebrae from four females and four males from the northwestern Atlantic Ocean. Age estimates were up to 73 years old for the largest male and 40 years old for the largest female. Age determination in fish relies primarily on analyzing growth increments in mineralized tissue, such as otoliths (ear bones), vertebrae, and fin rays. These grow throughout a fish’s life, adding annual rings, similar to growth rings in trees. Estimating age in white sharks can be challenging. While vertebrae are constructed of layers of tissue, laid down sequentially over an individual’s lifetime, the alternating light/dark banding patterns can be narrow and less distinct than in other species – and the bands don’t necessarily signify annual growth. “Traditionally, ageing sharks has relied on the assumption that band pairs are annual. In many cases this has been proven correct for part or all of a species life, however in more and more cases this is being disproven,” said co-author Lisa Natanson, a fisheries biologist at NOAA’s Northeast Fisheries Science Center (NEFSC) lab. For this study, researchers took advantage of radiocarbon produced by thermonuclear device testing done during the 1950s and 1960s. Radiocarbon mixed from the atmosphere into the ocean, and was incorporated into the tissues of marine organisms living during that time period. The rise in radiocarbon gave researchers a specific spot in time pinpointed in the vertebra layers, which can be used as a ‘time stamp’ to help determine the age of an animal. Assuming a lifespan estimate of 70 years or more, white sharks may be among the longest-lived cartilaginous fishes. While they are predominantly found in temperate and subtropical waters, white sharks migrate long distances and can be found throughout the global ocean. 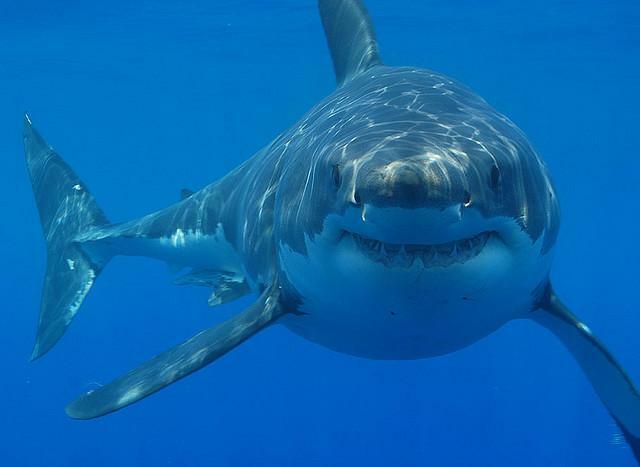 White sharks are considered vulnerable worldwide. Since individuals are slow growing and mature late, white shark populations could be even more sensitive to fishing, environmental and other pressures. “These findings change the way we model white shark populations and must be taken into consideration when formulating future conservation strategies,” said co-author Greg Skomal, a WHOI adjunct scientist and MA Marine Fisheries biologist.